Formed in 2009 through a commission from WomaJazz, the string trio Hear in Now features New York violinist Mazz Swift, Chicago cellist Tomeka Reid, and Italian double bass player Silvia Bolognesi. Individually the three women have performed and recorded with artists ranging from jazz musicians Anthony Braxton, Roscoe Mitchell, and Butch Morris to rappers Common, Jay-Z and Kanye West. On their second studio album, Not Living in Fear, the trio displays their affinity for free jazz and the avant-garde across 13 tracks of original music composed variously by members of the group. The project is a natural fit for the International Anthem label, dedicated to promoting boundary-defying recordings and occurrences of creative music in Chicago and beyond. Through the label’s sponsorship, we’re now able to appreciate these works, recorded by HiN in 2012 and 2014. Rather than easing into the album with a more accessible work, the trio fearlessly opens with “Impro 3.” The track builds slowly over long, sustained harmonies punctuated by a flurry of glissandos that provide a sense of foreboding as they lead to a freely improvised and frenzied climax. This is followed by “Leaving Livorno,” a more melodic work with a yearning quality that features a jazzy interplay between cello and violin. “Requiem for Charlie Haden,” composed by Bolognesi, is dedicated the late jazz bass player who died two months prior to this recording session. Bolognesi adds a touch of free jazz to the bass line and takes an extended solo, but otherwise incorporates Haden’s penchant for blending simple melodies with classical harmonies. Chicago jazz vocalist Dee Alexander is featured on the title track. Reid frequently performs with Alexander, so it’s fitting that they collaborated on this composition. To say this song is a highlight feels like a bit of a cop out, given its broader appeal, but I make no apologies. Clearly it was sequenced at the album’s midpoint to provide a bit of breathing room, and displays the trio’s extensive background in jazz (all have various jazz side projects). Throughout the album, the three musicians employ extended playing techniques. For example, col legno and other percussive effects are used in “Transiti” to emulate the chugging rhythm of a train, and the opening of “Terrortoma” is punctuated by an ominous thumping reminiscent of the sound of advancing soldiers. But these techniques are never overused; each composition offers multiple sections and thematic complexity. 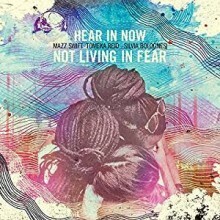 Not Living in Fear is a courageous album, brilliantly performed by three very accomplished women. They may frequently present concerts in museums, but the museum analogy often applied to classical music is certainly not relevant. Instead, HiN challenges us to hear the music of the present, defined in their own terms.